Many states have handgun only seasons especially for antlerless deer. In addition handguns can be carried in some states along with other firearms allowing the hunter to make the decision which firearm to use. Many hunters choose to take the challenge of using a handgun over a rifle because of the increased degree of difficulty. A hunter must get closer to the game animal and be able to be proficient with the handgun as well. Most calibers used for taking deer are large bore and can carry a hefty amount of recoil. 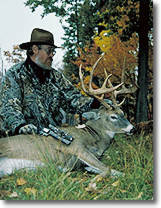 The .357 mag is the starting caliber for deer and is considered by many to be marginal. A .44 mag is good medicine for whitetails and will quickly and humanely kill the animal. This caliber carries a big kick and a big bang that can adversely affect accuracy unless the shooter practices a lot. A good rest with both hands on the grip will help greatly in getting good shots off with this caliber. Some hunters choose to compromise and go with the .41 magnum that comes close to the power of the .44 mag but without as much recoil. The Thomson Contender is a great hunting handgun. It breaks open and loads at the breach and can be fitted with a number of interchangeable barrels in calibers that are great for taking deer. The contender is a single shot handgun but the comfort of shooting it greatly increases the shooter’s accuracy making one shot often all that is needed. The secret to hand gunning deer is to pick a caliber that will quickly and humanely take the deer down, is capable of being handled well, and then practice, practice, practice, using a solid rest whenever possible. All firearms are dangerous in the wrong hands. Because of this it is imperative that we not only practice good gun safety ourselves but also to anyone else that might come into contact with a firearm. All firearms should be locked in a secure and childproof place. Children should be educated from little on about firearms and the respect for them that is needed. Trigger locks should be used with the key in your possession out of the reach of any child in the home. Always practice safe loading procedures. Firearms should not be loaded until after you leave your vehicle to go hunting or target shooting. Always unload your firearm before you enter your vehicle at the end of the day. By exercising good safe shooting habits your outings with your pistol will provide you with many hours of enjoyment and sport. Proper respect for all firearms should be practiced and handed down to others whenever possible. A pistol is short on advantages and long on disadvantages. However, the beauty of this firearm for deer hunting is in the eye of the beholder. Hunting with a handgun is unique. You limit yourself to a close encounter with a buck, and then you must make the shot with a hard-kicking big bore, but some hunters love that challenge. From a more practical standpoint, a small, relatively lightweight handgun is a pleasure to carry all day, and it wields easily in a blind or tree stand. Even the most accurate handgun cannot approach the efficiency of a tack-driving centerfire rifle. Too, many people find a big-bore pistol, complete with tremendous kick and noise, uncomfortable to shoot.